You're building your truck for a purpose, paying attention to every detail, every connection, and every movement. We built our systems this way, too. With these all-new, engineered-from-scratch systems, you can stop using junkyard parts to modernize your pickup and can bolt in the handling and performance you’ve always wanted. Ditch your twin I-beam front suspension for a completely new front end, and bolt in unprecedented adjustability on the rear without removing the truck bed. 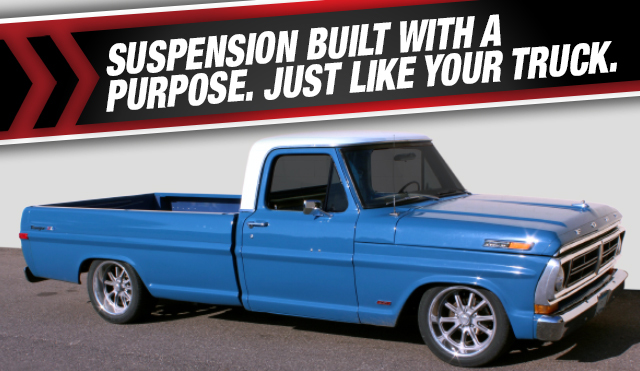 Ditch your twin I-beam front suspension for a completely new front end that has been engineered to make your truck handle while giving you the ride height adjustability to dial in the perfect stance – even with those larger wheels you’ve been eyeing! To let you choose whichever engine you prefer, interchangeable engine mounts are available for Windsor, FE, LS, and Mod/Coyote engines. Also available is a front sway bar to add even more stability for aggressive handling performance. Not just another 4-link - our bolt-in system adds unprecedented adjustability to your truck without any welding required, and the unique torque arm design maximizes performance without the inherent binding issue of other systems. Proudly made in QA1’s Lakeville, Minnesota facility.